Whether you follow myself, or just about any other wellness blogger on social media, you may have seen shift recently in the beverage du jour filling our stories and your screens. 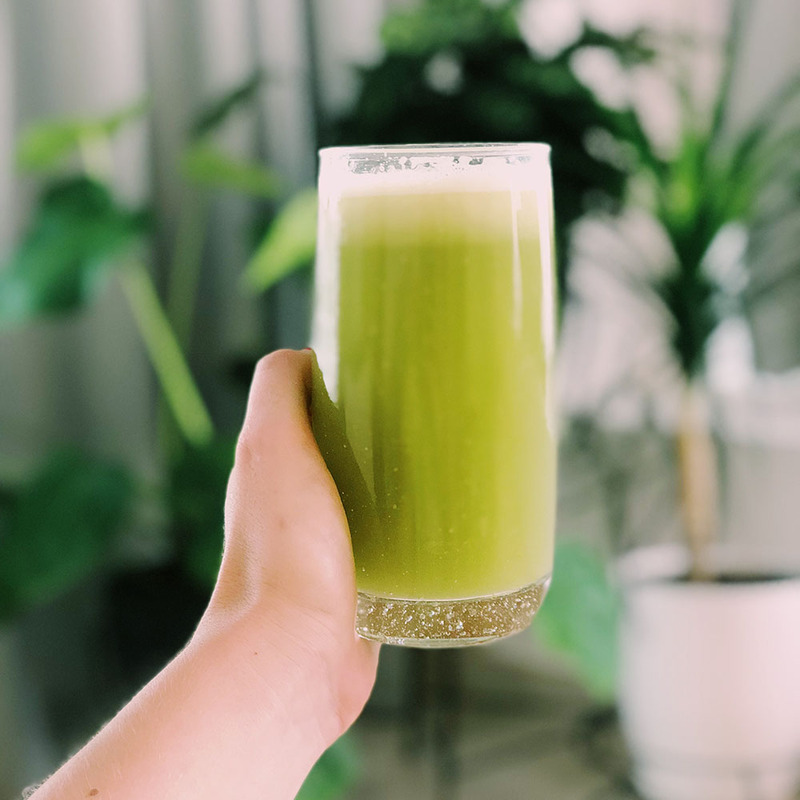 Moving on from the dark, kale-filled green smoothies seen lining up boutique studios after a spin class, there's now a lighter morning juice stealing the limelight as the all-encompassing healing elixir of choice – celery. However, it is not just another trend that those in the wellness industry are going crazy for, celery is in fact a powerhouse grocery staple, packed full of antioxidants, phytonutrients and enzymes, with scientific reviews backing its anti-bacterial and anti-inflammatory properties. A natural diuretic, helping to flush and assist the natural cleansing of the liver, the humble, green stalks also have an ability to balance blood pressure levels. There are even claims that the mineral content within celery can elevate stomach acids, enhancing digestion across the day, though these are yet to be confirmed by studies. Impetus for the trend emerged in large part due to the rising popularity of the "Medical Medium” Anthony Williams, who includes a daily celery juice, taken on an empty stomach, as a crucial part of the protocol to heal a range of ailments ranging from eczema through to Lyme disease. On his blog, Williams explains celery juice has an “incredible ability to create sweeping improvements for all kinds of health issues”. Claiming that it is the “saviour when it comes to chronic illness” he reports within his practices he has seen countless cases of individuals suffering from chronic illness restore their health from drinking 16 ounces of pure celery juice daily. INTRIGUED? read on to find out the benefits for your body on celery juice! Celery contains antioxidants with high anti-inflammatory properties, helping to alleviate high inflammation markers or symptoms within the body. These antioxidants help to support overall health, especially the reduction of free-radicals or oxidative stress. Williams goes further to claim that drinking celery juice can reverse inflammation by starving certain pathogens, including unproductive bacteria and viruses such as Epstein-Barr Virus – touted the cause of Hashimoto’s and other diseases classified as autoimmune diseases. Whilst this has not yet been proven by Western medicine, the anti-inflammatory properties have been studied and the results indicate that indeed celery has the capacity to lower inflammation. Celery has long been utilised as a herbal medicine thanks to its antibacterial effects, however the vegetable received mainstream acknowledgement when one study found the compounds in celery where able to help purify and reduce bacterial growth in humans. This antiseptic property indicates the use of celery as natural immunity booster to help fight bacterial infections. Just what you need to for those winter months! Containing high levels of sodium and various mineral salts, celery juice has the powerful potential to assist in balancing the body’s pH levels – neutralizing acidity and creating a more alkaline environment. The enzymes in celery raise hydrochloric acid in gut – which is critical to digestion and in keeping digestive system in an alkaline state. If your hydrochloric levels are low or out of balance, your food is not digested sufficiently in the stomach, therefore it doesn’t break down properly, often causing painful bloating, and limiting access of the to the nutrients you are consuming. Williams also details that the mineral salts in celery help to keep kidneys and adrenals functioning, cleanse and repair the stomach, digestive tract and liver, whilst supporting the function of the central nervous system. Along with improving the pH balance of the gut, celery also releases nutrients from its fibres when juiced that promote optimal functioning of digestive system. As a gentle, natural laxative, drinking celery juice can assist in regular bowel movements (crucial!) and helps to soothe discomfort from indigestion, bloating and even acid reflux. Celery has anti-hypertensive properties thanks to the presence of three active ingredients which helps to promote healthy blood pressure. It is believed that celery can help lower blood pressure by acting as a smooth muscle relaxant, improving blood flow and the transportation of nutrients in and out of the cells. As a natural diuretic drinking celery juice helps to flush the liver, working as an aid for the natural detoxification process of eliminating waste from the body. This cleansing also helps to increase bile production and may ease chronic bloating. Celery juice is high in electrolytes which allows for hydration to the body on a cellular level with rich minerals. This helps to replenish lost electrolytes due to heavy sweat, promote optimal functioning of all the body’s complex systems, stabilizes the adrenal glands, maintain detoxification pathways and enhances skin quality. The best way to consume celery juice is to drink 16 ounces of pure, organic celery juice on an empty stomach first thing in the morning. You should then wait at least 15 minutes before eating. The best and most cost effective way to do this, is to bulk-buy celery and keep it refrigerated. If you have a juicer, simply juice it fresh in the morning and drink immediately. If you do not have a juicer, you can still blitz the celery with water in a blender and strain through a cheesecloth to receive the same benefits. Note: If you’re sensitive and find that 16 ounces is too strong for your system, start with a smaller serving size and build up to the full 16 ounces slowly.